This article is about the men's team. For the women's team, see Netherlands women's national basketball team. The Dutch national basketball team is the basketball team that represents the Netherlands in international competitions. It is administered by the NMT, an organisation solely for the national team. When it qualified for the FIBA EuroBasket, team Netherlands played quite competitive at some of the tournaments. The team reached the Final Four once and proceeded to the playoffs several times. However, its last appearance was in 1989 when it finished 8th. Since 1991, the team has had some tough years, overshadowed by lack of both money and support from fans and media. In the 2015 tournament they made their first appearance in 25 years, only two years after it had been proposed that the team should be dissolved. The team also represents itself as the Orange Lions. The Netherlands were one of the teams that played in the 1946, 1947, 1949 and 1951 EuroBasket tournaments. The 5th place in 1949 was the best performance of the team. Oranje qualified for three EuroBaskets in a row from 1961 till 1967. After two missed tournaments, the Netherlands had another 3-EuroBasket appearances streak. In 1977, the Netherlands' star player Kees Akerboom, Sr. shone during the tournament. He was the top scorer of EuroBasket and got a place in the All-Tournament Team. In 1983, the Netherlands had its biggest success in history under head coach Vladimir Heger: the team achieved fourth place at the EuroBasket tournament. In the third-place game it lost to the Soviet Union. From 1991 until 2012, the Netherlands did not qualify for a EuroBasket tournament. Star player Francisco Elson, former NBA-champion, represented the team on several occasions but the team never came close to qualifying. In this period, notable Dutch players like Dan Gadzuric were not willing to play for the team. Home games were usually played at the Topsportcentrum in Almere and usually had little to no media attention or fan support in the Netherlands. In December 2012, it was announced that the Netherlands team would be dissolved for 2 years, because the national federation NBB was not willing to invest money in it. After a campaign by Dutch players who played in the Dutch Basketball League, the national team was eventually saved. Sports broadcaster Sport1 became the main sponsor and DBL-teams invested in the team, which started playing again. During August 2013, the Netherlands was on its way to qualification for FIBA EuroBasket 2015, but lost two games 20–0 because the team played with two players – Mohamed Kherrazi and Sean Cunningham – who were identified as foreign players by the FIBA. The NBB believed that both were eligible players, and was upset that the attention came up after the Netherlands already won 2 games. At the start of the second 2015-qualification round, things looked bad for Oranje. The DBL-teams didn't have any more money to invest in the team and the NBB wasn't ready to take the team back. Head coach Toon van Helfteren, who worked as volunteer, still did prepare for the qualifying games. He invited 42 players to play for the national team, but after most (notable) players rejected the offer, he started his first training with 7 players. The team eventually shocked the world, by beating heavy favorite Montenegro in the group to get the second place in the group. On 27 August 2014, the Dutch national team qualified for EuroBasket for the first time in 25 years. The national team left the NBB and FEB, from 2015 the team was run by the NMT. Van Helfteren extended his contract with the national team. In contrast to the summer of 2014, big name players from foreign leagues applied to play for the national team. In the first game at EuroBasket 2015, the Dutch beat Georgia 73–72 behind Charlon Kloof's 22 and Worthy de Jong's 16 points. The Netherlands remaining four games were lost, but only with single digits to power houses such as Croatia and Greece. Roster for the 2019 FIBA Basketball World Cup qualification (Europe). F/C 13 Schaftenaar, Roeland 7004109950000000000♠30 – (1988-07-29)29 July 1988 2.11 m (6 ft 11 in) Ionikos Nikaias B.C. ^ "Team profile". FIBA.com. Retrieved 15 May 2011. ^ "Nederlandse basketballers gered door Sport1". Volkskrant.nl (in Dutch). Retrieved 2014-06-15. ^ "Netherlands Incur Penalty". FIBA Europe. Retrieved 2014-06-15. ^ "NBB niet eens met straf". NOS. Retrieved 2014-06-15. ^ "Eredivisie basketbal Nederland". Basketballleague.nl. Retrieved 2015-01-16. ^ "Basketballers na 25 jaar naar EK". Nos.nl. Retrieved 2015-01-16. 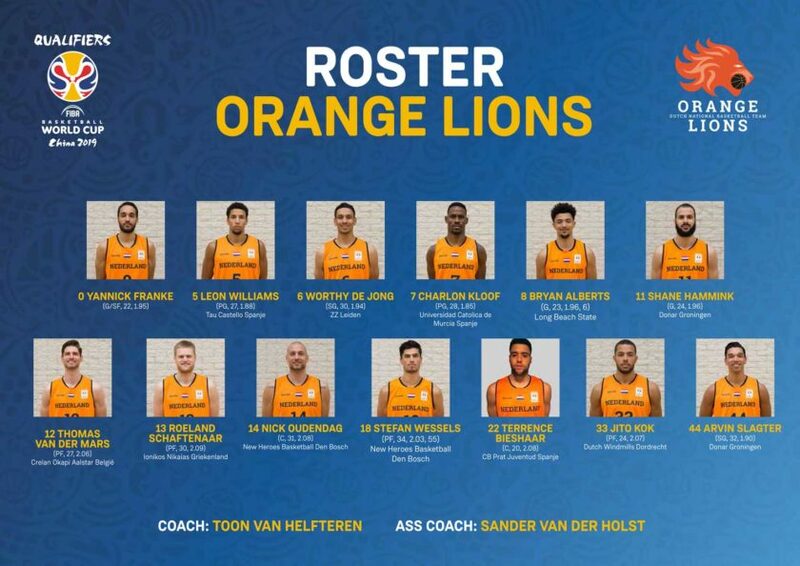 ^ "NETHERLANDS 2019 FIBA Basketball World Cup qualification Roster". OranjeBasketbal. Retrieved 5 September 2018.